Looking for a list of crazy cat gifts and unique ideas for the cat lover in your life? What do you get the feline lover who has everything? Let's find out. These are for your favorite ailurophile. 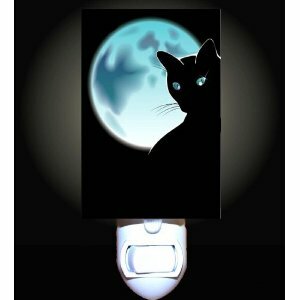 These striking and unusual cat-themed nightlights are a unique offering from Amazon. Catsplay has some unique gifts. This custom cat photo blanket makes for a unique and very personal gift item. It occurs to me that this actually might be a good blanket for owner and kitty as well. Good for making soft bedding for baskets or draping over chairs or sofas, or maybe for cat and owner to share on a rainy Sunday. Madagascar is hilarious, and one of my favorites. Alex is a star at the Zoo, but doesn't really have any clue about what being a lion in the wild is really like. That is, until he ends up in Madagascar and starts feeling like he wants to eat his friend Marty the Zebra for lunch. In The Wild a lion's cub is kidnapped and needs to be rescued. To the rescue comes a koala, a squirrel, a giraffe, and an anaconda. Meanwhile, a herd of wildebeest have unexpectedly caught the self-improvement bug and want to raise their status on the food chain. If you know someone who is away all day, get them the DVD For Cats: While You Are Gone so their cats can have something interesting to watch on TV. I've heard that some cats are fascinated by these videos and the accompanying sounds. Need I say anything about buying a cat lover a Garfield movie? I thought not. All cats scratch. It's instinctive behavior that can't (and shouldn't) be untrained. But, cats can be trained to scratch certain objects, and leave the couch alone. It's been said that carpeted scratching boards are too much like furniture in their texture, and confuse the cat. Other scratching boards can be, well... ugly too. That's where Scratch 'N Shape comes in. From Imperial Cat comes a line of several designer scratching boards in styles that are certainly different from almost all other products. Their scratching surface won't confuse your cat, and feels more like the soft wood that a cat in the wild would prefer to scratch on. They're environmentally friendly, the unique shapes satisfy both vertical and horizontal scratchers, and they offer a sleeping spot as well. Pretty cool! You can have a look at the variety of scratching post products from Catsplay here. Tuff Kitty is... tuff! Not for the faint of heart, visit the Tuff Kitty Zazzle store for a bunch of products with the Tuff Kitty graphic and obnoxious sayings. Literary gems like "what happens in the litter box stays in the litter box" can be ordered on mugs, tees, aprons, post cards, mouse pads, and more. If you know a Tuff Kitty fan, or anyone who has "cattitude," then these might be good gifts. Let's face it, scooping litter (and cat box cleaning in general) is no fun. If you've ever done it yourself, you'll appreciate a gift from someone else that made the job that much easier. Is there a better gift than one that eases someone else's pain? The Durascoop does just that. I've used flimsy plastic scoops, and in addition to them flipping litter all over the place as they bend, they get all mucked up with litter and are hard to clean. If you have a cat that likes to urinate on the bottom of the box and then cover it up, you know how hard it is sometimes to dig that litter out with a cheap plastic scoop. Well, problem solved. The cat lover in the house who has to scoop will love you for this gift. In addition to being made of metal so it doesn't flex and is easy to get to the "hard stuff," it's lightweight. And, it has an ergonomic handle with a comfortable grip. For someone with arthritis, this may make scooping less painful. No matter what, you'll get a thank you for buying this product. Some cats love being groomed, others hate it. For others still, it's a love-hate. So, too, with the Furminator. Some people love it, some people hate it. To prevent hair balls (the number one cause of feline constipation), encourage bonding, and allow the chance to check for possible physical problems, cats should be groomed often. The Furminator deshedding tool is one of the best grooming tools for cats. The Furminator will remove large amounts of fur better than almost any other grooming tool. It's especially effective for medium to long haired cats and those with very thick undercoats. This reduces hair balls, cuts down on laundry and cleaning bills, and reduces loose cat hair around the house. There's a version for long haired cats or short haired cats, and you can choose small or large, too. You can also use it to make a cool cheap cat toy! What present do you get for the cat lover who has everything? Something for their cat, of course. If you've got a cat lover on your list, you can't go wrong by buying a gift for the kitty too. It doesn't matter what the occasion is, adding a gift for the feline in the house is sure to brighten any cat owner's day. Below are some great ideas. Now, don't get me wrong. If it's a birthday or another big holiday, and you fail to get your better half a gift, don't point them to this website and say that I said to get the cat something instead. You're not getting off that easily! Getting a special something for the kitty is an added bonus, just don't forget your special someone. There, now it's in print (well, on screen anyway) so you have no excuse. Looking for a unique gift for a cat lover? Many cats don't drink nearly enough water, which can lead to health problems. Automation and technology are coming to the aid of a house cat near you. 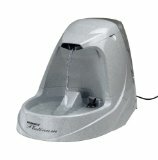 The Drinkwell Platinum Pet Fountain appeals to the curious nature that many cats have with regard to running water, while providing a constant supply of filtered drinking water.